Continuing our series on activity trackers and their role in the gamification of health (see reviews on the Fitbit Ultra and Nike FuelBand), the Jawbone UP was released last fall to quite a bit of fanfare. Jawbone had established a solid reputation with their highly-acclaimed bluetooth headsets, which combined top of the line functionality with sleek and stylish designs. With the UP, they hoped to continue their success into the burgeoning fitness technology market by releasing a slick, revolutionary device worn around the wrist, at a reasonable price of $99. Unfortunately, shortly after release, reports came piling in of a device-breaking defect that affected a large majority of users. This PR nightmare led to Jawbone taking the extreme measure of issuing full refunds to every owner (with promise of replacements when the issue is resolved), and the UP was pulled from the market. As an original buyer of the UP, I was able to obtain a replacement that seems to be unaffected by the defect. Does the UP have enough for Jawbone recover from this significant setback, or has Nike stolen its thunder? When the Jawbone UP hit the market, it was a one of a kind device. The FuelBand still did not have a release date, and the Jawbone was on store shelves, as a uniquely trendy wrist-worn pedometer that communicated with the iPhone. Like the Fuelband, it resembles a black Livestrong-style bracelet, but unlike the FuelBand, it wraps around and clings to the wrist, rather than requiring a clasp. 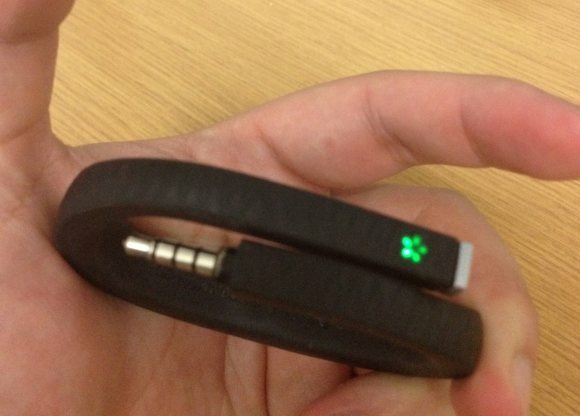 Also unlike the FuelBand, the Jawbone tapers significantly on the ventral aspect of the wrist (although it remains nearly equally thick on the dorsal aspect). There is only one button on the UP, which is activated by pressing one end of the bracelet. The other end consists of a headphone-style jack covered by a removable cap. Immediately next to the end with a button, there are two small hidden LED indicators. One is a star icon that shines different colors to convey different messages, and the other is a blue moon icon that shines when you activate the sleep-tracking mode. Unfortunately, while the tapering width and clinging design provides a lighter and less cumbersome design than the FuelBand, the UP lacks the ability to output information via a screen. 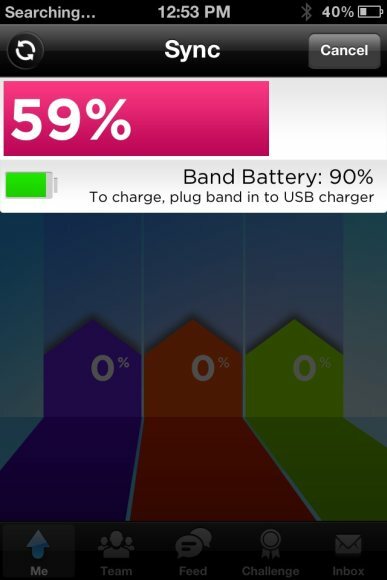 After using the FuelBand and UP, both of which have informative screens, its absence on the UP is notable, although the option to sync with the iPhone to display data is always readily available. In an impressive feat, the Jawbone UP actually innovatively syncs via the iPhone’s headphone jack. (Android support is coming at a later date). You simply remove the cap, plug in the Jawbone to the iPhone’s headphone jack, open the UP App found on the iTunes Store, and then press sync. In about 20 seconds, the sync is complete. It actually is very straightforward, but in the end, it is still not wireless, and requires user intervention every time to sync. There are a few silver linings, though, with the UP’s method of syncing. The data transfer process itself is significantly faster than the FuelBand (which can take minutes), and it does encourage more active usage of the well-designed app, since this is the only way of viewing data. Whereas the FuelBand and Fitbit provides a small amount of information on its LED screen which often obviates the need to utilize their respective apps, the UP forces you to utilize the app to see ANY information, thusly exposing you to its app’s informative charts and graphs. David, how often do they(jawbone) update the iOS app? Even with the recall, are they at least still making app updates. they are updating the app. it has gone through a fairly drastic evolution since December, in fact, which makes me suspect that they are planning on still releasing the UP, at least in some form. Hardware: Internals have been dramatically reinforced (breakage afflicted many 1.0 devices); the new version is apparently fully waterproof and shower-ready. The App: … is vastly improved, according to users. The “Food Log” now supports barcode scanning and a large database, in addition to the old photo feature. Once typical/favorite foods have been flagged, it seems to be a one or two-tap process to enter caloric intake. Sync: I initially considered the lack of wireless sync to be a deal breaker. You’re the only review I came across to see this as a potentially positive feature, but in thinking about this I realize that I completely agree with your rationalization… The fact that sync is an active, as opposed to passive, process with the UP would force me to directly engage with the – now very useful – app and my data. Something I might not do otherwise… An Android app is said to be in development. Comparisons: For me, mainly the Nike+ Fuelband. It’s stylish and well-made, and has a neat LED readout, but seems like something of a one-trick pony… It’s essentially a wireless pedometer (and, according to reviews, the Fuelband’s accuracy fluctuates significantly). 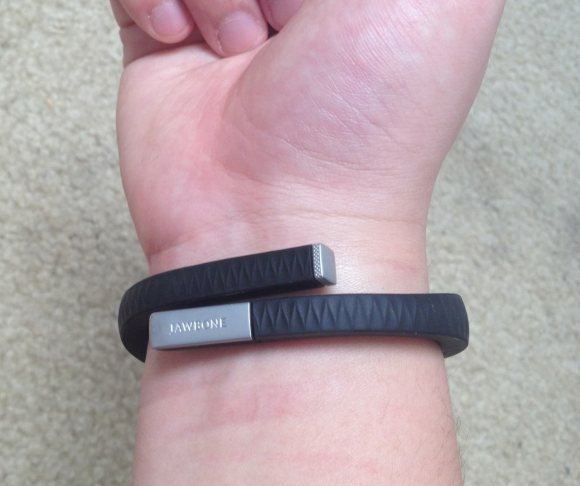 The Fitbit covers most of Jambox’s functionality, but I’m not personally crazy about a belt-clip device. The new LarkLife seems to blend the best and worst of both… features of the UP and the bulkiness of Nike’s device (plus, LarkLife seems to be pushing recurring fees beyond initial purchase price).